Jungle Red Writers: How's the Weather? Anyway, this got me thinking about severe weather in general, and how I tried to use it to up the ante for the characters in my upcoming KILLER TAKEOUT. When I meet a long-time resident of the island, one of my first questions is: What do you do about hurricanes? Stay or go? Leaving is no picnic, because there’s only one road off the islands and the congestion can be overwhelming. Besides, how do you know where the storm’s headed next? The hard-bitten native conchs just hunker down and hope for the best. But there are lots of horror stories about staying too—Hurricane Wilma for example, didn’t do a great deal of damage, but the storm surge after was very destructive. 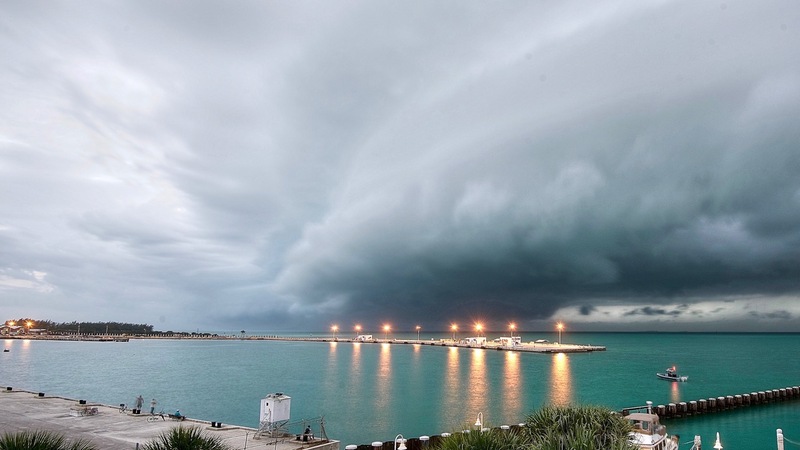 I haven’t lived through a hurricane in Key West and I hope to skip that experience. We have lived through Hurricanes Irene and Sandy while in Connecticut, and that was no picnic. Let’s face it, I’m a weather wienie! Reds, what’s the worst weather you’ve experienced? Do you enjoy the pageantry of nature or would you rather skip it? How have you used weather in your writing? HALLIE EPHRON: A waterspout? Yikes. That same night in Boston we had high winds, rain and lightning that went on booming and crashing for hours. I unplugged the computer, stuffed my ears with Kleenex and tried to sleep, because what can you do except survey the damage in the morning? Fortunately all we lost was a tree limb and it didn’t fall on the car. Worst weather I’ve been through ever is last winter’s snow. In January/February 2015 we got 110 inches without a thaw. I didn’t leave the house for weeks unless I absolutely had to. Roads were narrowed to one lane and you took your live in your hands just pulling out of the driveway. The car horn got used more than the brakes. It was May before the snow was all melted in the yard, and the silver lining was an absolutely spectacular spring. EVERY spring-blooming thing burst into bloom at the same time. SUSAN ELIA MACNEAL: My family and I were caught on a bus in Park Slope, Brooklyn, in a tornado! Toto, we're in Brooklyn, Not Kansas! Someone recorded it and put it on YouTube—here's the link: It was surreal — green, murky, insane winds. We saw a hundred-year-old tree ripped right out of the ground from the bus window. We also weathered Hurricane Sandy in Brooklyn. That was less scary, personally, because we live at a high elevation (so no flooding) and also in a sturdy Victorian brick building. Still we taped up our windows, just like the Brits did during the Blitz, and I prayed for everyone affected—and also that our oversized windows would hold. Which they did. Afterwards, gave blood, took blankets and canned food to a relief center a few blocks from us (the local YMCA). It was a crazy storm and people in the hardest-hit areas are still in recovery. HANK PHILLIPPI RYAN: Massachusetts! Where there's never a dull weather moment. I've covered hurricanes on Cape Cod, certainly, where the winds are more than 90 mph, and the sand hits your face like a million straight pins. And ice storms, where the trees, and everything, are completely coated. Beautiful, and deadly. And yes, last year the snow was so high it was over the cars--seriously, there were cars parked on the streets and you couldn't see them. But a few days ago, I woke up to HOWLING winds. And I thought, wow, we're going to have some fallen branches. Woke up the next morning to see Jonathan standing over me. He said, "Sweetheart, we have a situation." Our back fence had blown down! Like--WHAM. Flattened. RHYS BOWEN: We lived in south Texas for three years where weather was always dramatic. Summer thunderstorms spawning tornadoes, hurricanes, lightning that lit up the whole sky and brought all four kids scurrying into our bed at night. I once flew into Chicago after a blizzard and the snow was taller than me beside the road. Didn't like that much, either. I'm currently in Arizona where we've had perfect temps and sunshine for weeks. My kind of weather! But I have to agree, Lucy, bad weather can enhance the drama and suspense in a novel. JULIA SPENCER-FLEMING: Hank, I love "We have a situation." Such a calm way to introduce major property damage! I'm pretty well known for the bad weather in my books - I maintain there's nothing like nature's fury to elevate the suspense and the stakes. After all, didn't Dame Agatha trap everyone on the island with bad weather in Ten Little Indians? Spending my teen years in upstate New York's snowbelt and my adult life here in Maine, all my bad weather is snow, ice and cold. There was the Christmas eve when we left midnight mass to discover two feet of snow had fallen and my dad had to wait for a plow to follow to get us all home. There was the time Ross and the kids and I left Hudson Falls, NY with a light scattering of flakes that turned into a blizzard as we we drove through the Green Mountains. Snowpocalype '14 - '15 was unrelievedly awful; we had something like 100 inches of snow and the coldest February since 1895. But for me, personally, the WORST weather was the ice storm of '98. Power lines down everywhere, roads impassible, walking on glare ice outside and we were without power on my street for NINE days. Nine days with no running water, no phone service (we didn't have a cell phone until '02) no electric lights, no heat except the fireplaces and woodstoves, and two kids, four and five, underfoot. The silver lining? I used an ice storm just like it is as the background for my last book, THROUGH THE EVIL DAYS. DEBORAH CROMBIE: On the day after Christmas this year, we had nine tornadoes sighted in the DFW area. NINE! The strongest struck the town of Garland, just a few miles to the east of us, and was rated an EF4--the first EF4 since a tornado struck Lancaster, south of Dallas, in 1994. This was the first EF4 tornado reported in the United States since 2000. There were eleven fatalities and the damage was staggering. Here's a photo of just one of the tornadoes. We live in tornado country--we know this can happen. We have go-bags and a safe spot and a plan, but, really, you're never prepared. This time, we thought the storms were coming straight for us, but at the last minute they shifted direction. I spent an anxious hour huddled in our hall bathroom with flashlight, phone, radio, and the two German shepherds. Then we spent the rest of the evening watching the terrible damage reports on the news as they came in. I much prefer my weather in books. I think my favorite use of it was the snowstorm that traps my characters in Crystal Palace in south London in The Sound of Broken Glass. But I think my personal "scariest weather ever" moment was about twenty years ago, when I drove halfway across England in a hurricane. I hope never, ever, to do anything like that again. LUCY: Yes, Julia, you are a master at using the weather to best advantage, starting with the first line of your first book! It was one hell of a night to throw away a baby. Worst weather? Last winter’s never-ending snowstorms that kept us housebound . . . And then there was Hurricane Sandy, although our house is high enough and just far enough from the shore that we did not flood . . . people here are still rebuilding . . . .
That is an amazing photograph, Lucy! Like Julia, I lived through the ice storm of '98 here in Maine (and have the T-shirt to prove it), although we were only without power for five days. We had our woodstove for heat and to cook on. We were in the local Food City, which stayed open with flashlights and an old style cash register, when the power came back on. There was much cheering.It took much longer for other areas to recover and the poor trees, weighed down by ice, made these awful cracking sounds when the branches broke off. A lot of them just snapped right in two. Most of the state and a good chunk of eastern Canada were affected. They flew in trucks and crews from states to the south to repair all the power lines that had gone down. Still, I'll take another ice storm over a hurricane or a tornado any day! Summer of '69 (wait, isn't that a song?) --major thunderstorms rolled through our area of northern Ohio--flooding left roads closed, bridges washed out, and our cows stranded on hillocks in the pastures. Blizzard of Jan '78--days of unseasonable warmth followed by snow that closed down the county for the first time in my memory. Weather used to great effect in books? Loved The Sound of Breaking Glass--the Crystal Palace/ice storm mirroring! Bad weather events? I've survived a few. The Blizzard of '78 when I was an undergraduate in Boston. Legendary storm. Then there was the Patriot's Day nor'easter of 2007, when dozens of huge spruce trees surrounding our log cabin in the Peaks Island woods fell all around us. That was terrifying, and the aftermath was heartbreaking. All those beautiful trees lying on the ground, and the realization we now had a log cabin in a big clearing. Yes, the Blizzard of '78, when it was not only -35 and accompanied by feet of snow, the water main at the corner of my street broke twice in 24 hours. The intersection is at the bottom of a hill in both directions, so the water pooled and froze a foot thick. Snowplows had to push the ice out of the intersection, and they encased our neighbor's car, parked on the street, in ice above the windows. She had to get rides to work with others for over a month. But the worst, for me, was trying to get my daughter to her dad's house on the other side of town, and getting ice in my gas line (remember when that used to happen?). My little car died on the expressway. It was only -24 then, but it was still horribly cold to be standing outside trying to flag someone down to help us. My daughter was only seven, and crying, and I was worried she'd freeze her face. Lucy, may you never need to beat feet from Key West. I can't imagine. The -24 was the night before the -35. And I had to leave my poor little car on the expressway for days. No one could drive anywhere. Just putting in a word for Nancy Pickard's books if you want to see how weather can be used brilliantly in a crime novel. Virgin of Small Plains and The Scent of Rain and Lightning both are memorable for their weather. Oh yes Hallie, Nancy is brilliant with weather. Karen and Brenda and FChurch--horrifying stories. 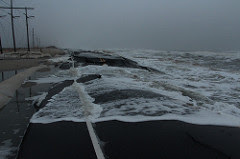 Kathy, your post reminded me of Hurricane Irene. We were in CT and John had surgery the day before the storm hit. The hospital should never have sent him home, but they must have been trying to clear out the beds. We had to evacuate from our house--me with a post-surgery patient, the cat, and the dog. We had some very kind friends who took the sad group in. We finally did get home, but no power for the next week. Every day, I'd drive into town to charge the phone and look for signs of the power company. Very unpleasant memory! I'm enjoying this discussion because I love weather, whether in real life or in books. Having lived/summered on the coast in Scituate, Massachusetts my whole life, I learned to enjoy whatever Mother Nature delivers, which is one of the reasons I made my protagonist a meteorologist, albeit one banished into retirement. I remember blizzards and hurricanes with some actual fondness for how they bring communities together, but the storm I found most chilling was the No Name Storm. Three days before the under-forecasted storm actually arrived, my teenage son called me at my office in Scituate Harbor. "You'd better come home, Mom. Something's going on with the ocean." A few years ago, we got a snowstorm on President's Day that left three feet of snow and knocked out the power for a day or two. My brother-in-law was visiting and left Pittsburgh to go back to Buffalo to escape the snow (there's irony). Fortunately we have a wood stove, so we stayed warm. I remember a microburst in the late 90s that knocked out our power for a week. Everything in our fridge went bad. I remember tying wet towels around our faces because the stink was so bad. I worked in Puerto Rico right after Hurricane Marilyn. One day they told us another hurricane was coming and the plan was to evacuate to the naval bunker, which had really thick concrete walls. Fortunately the storm took a right turn and went by us. Having spent much of my life in Central Ohio, I'm used to pretty dramatic weather. We have tornadoes every spring/summer, to the point that I probably don't take tornado warnings quite as seriously as I should. I have seen the devastation they can cause, but we get so many warnings that I tend to be pretty matter of fact about it. We get blizzards, as well. The blizzard of '78 is widely remembered as the most dramatic, but I remember one with less snow but heavy ice from the early 1990's that had power out for a lot of people for many days. And while we are usually unaffected by hurricanes, Irene reached all the way to us, again leaving vast swaths of the population without power for over a week. A favorite book that uses weather to great effect is Storm Track by Margaret Maron. The building tension in the plot nicely parallels the increasing worry as a hurricane approaches. Mary, I had forgotten about the trauma of a fridge full of rotten food. Especially if you've been freezing tomato sauce and local peaches and tomatillo salsa all summer! How scary to be helping with the aftereffects of one hurricane and hear about the next one coming. Susan, I haven't read STORM TRACK--will have to put that on my TBR list! Picture it: St. Patricks Day 2002. 29 inches of snow in 24 hours. I'm snowed-in for three days in my 1500 square foot condo with my hormonal 17 year old daughter, the Banshee. That was hell, my friends. Keenan, we need a 'Like' button on this blog! Julia, I immediately thought of Through the Evil Days for its weather related setting, with Russ and Clare being stuck in their get-away spot and having to deal with the bad guys in it. The icy sidewalks and streets in The Sound of Broken Glass has stayed with me, too. I hate ice! 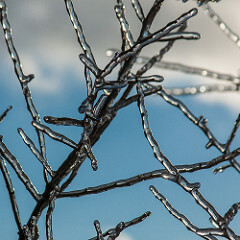 The worst, most depressing weather related time for me was during our ice storm of January 2009. The ice covered everything, bending trees until they broke and weighting down power lines so that electricity was lost for anywhere from a few days to a few weeks. We lost power for right at a week, and for five of those days I toughed it out in my house with my son here. He and his friends brought in firewood, but it was so bitterly cold, too, that even that was little comfort. Of course, I did have a book that helped me bear up. I was reading The Yellow-Lighted Bookshop by Lewis Buzbee, a book about the passion of books and reading, and that connection helped pull me through. To add insult to injury though, one of the times I was out in my car during that time, a giant icicle fell from a lightpole I was driving under and broke the glass out of the window across the back of my car. It sounded like someone had shot a gun, and I can tell you that I became quite unnerved and close to hysterical. I spent the final two nights at my mother-in-law's and my son went to a friend's house before our electricity came back on. I wouldn't leave our house at the beginning because of our dog. My MIL doesn't like dogs in the house, and I wasn't going to go stay at her house and leave Abbie in her garage. MIL finally said it was okay to bring Abbie with me. I do enjoy weather playing a part in books. Maybe one reason why a favorite setting for me is Scotland is the weather that must be constantly dealt with in those stories. Oh, and I love fog, so I'm thinking that maybe a certain book coming out tomorrow by Rhys might be right up my alley. And, Lucy, I'm looking forward to seeing how severe weather impacts Haley and her adventures. LOL Keenan, FChurch is right--we need a like button for that story! Kathy, your experience sounds awful too. thank goodness your MIL saw the light. Did she warm up to Abby?? Oh, I almost forgot! There was the time I was driving back to Buffalo from Pittsburgh after visiting the hubby (I don't even think we were engaged yet). Hit a white-out around Meadville. I stopped just outside Erie and shoveled a foot of snow off the roof and hood of my car (yes, off my car despite the fact that the engine was running). Just the other side of the Erie tollbooths as I crossed into New York I had to stop and shovel another foot off. It took me almost an hour to go those fifteen, twenty miles. The entire 3.5 hour trip took at least twice that. Lucy, unfortunately, my MIL just doesn't consider pets as family members. My father-in-law had bird dogs that were kept outside. Oddly enough, my sister-in-law, MIL's daughter, loves dogs and is something of a dog whisperer. She and her family have always had two inside dogs at a time. Mary, I would have been in full panic mode, although it's interesting when we look back on what we do when we're young. When my husband and I first were married, he was doing his training he owed from being in ROTC in college and was at Ft. Knox. I was teaching, and I had planned on driving to spend the weekend with him that Friday after school. It started snowing and got so bad that I was the last car allowed on the parkway before it was closed. I drove through the storm and slick roads to be with him. And then, he was sick in bed all weekend due to a reaction to a flu shot. At least I didn't have to clean a foot of snow off of my car, twice. Gulp! Susan, thanks for the link - the article is fascinating. Keenan, the advantage of living in the countryside is that there are shovels, snowshoes and woodpiles to keep the hormonal teens busy. The power went out in the Ice Storm of '98 in the middle of my little ones watching ALADDIN. For days afterwards, my son would walk up to the TV, place his hands on the screen and ask hopefully, "Aladdin come on now?" Oh and great weather writing: Kent Krueger's books set in northern Minnesota. Kathy, too true. If that happened now, I'd pull off and find a hotel to hole up in until the storm had passed! At 20, I was stupid enough to keep driving. Oh poor Aladdin. That's so funny and cute. Having bounced around between Texas, Ohio, Minnesota, and Louisiana I think I've seen weather! We had high winds just the other day here in Houston. I keep finding pieces of shingle in the side yard and hoping it isn't ours. We hunkered down when Hurricane Ike blew through a few years ago. My inlaws drove in to stay with us since their house is surrounded by huge live oak trees. I think I twisted my little brother's arm to make him go stay with my parents who had just moved back here from the Dallas area a month or two before. We came through it fine. We led my inlaws out past the flooded streets so they could get home again. Our house was in a little pocket that didn't lose power, so we hosted my folks for a few days, then my little brother, until their power returned. We also had various people over to use the computer, do laundry, take our ice. All the neighbors pitched in with clearing trees and limbs out of the streets. And you could see the demarcation line for power and no power one street over. The houses on the west side all had extension cords snaking across the street to their powerless neighbors on the east side. When we lived in the panhandle tornados were a fact of life, but I fortunately did not have to experience one firsthand. But that greenish tint and wall cloud are ominous. I still have dreams where I am hunkered down, waiting for one to hit. Our closest call came when we were in Ohio. I had gotten home from work and didn't like the looks of things. I took the boy and the dog down into the basement and waited it out. Turns out a tornado was skipping about and happened to skip over our town but hit another one east of us pretty hard. I guess we need one blizzard story. Or white out. Back in our youth my husband and I were driving from El Paso to Denver to visit my brother. We wound up in a snow storm. We pulled off briefly to put chains on the car. While George the airedale was making yellow snow Frank was being blown off the ice-covered road trying to put on the chains. We made it, but the interstate was being closed behind us as we crawled along. I guess the weather is always a safe topic these days! What great stories! Kathy Reel, the icicle coming through your car window must have been terrifying. But wouldn't that be fun to use in a book? There really was an ice storm a few years ago in Crystal Palace. My friend who was living there couldn't get anywhere for days. Not only was it impossible to drive, but impossible to walk down the steep hills to either train station. I haven't read Storm Track. Thanks, Susan, for the recommendation. And I second Julia's comment about Kent Krueger's books. All these stories make you think about how vulnerable we really are, don't they? The strangest weather-related thing I've seen happened a long time ago. As a child during Hurricane Audrey in 1957 (thanks Wikipedia for the date), I watched my grandmother's climbing rose being "removed" from its trellis. There is no word that explains what that looked like. When the storm had passed and my dad went outside to check the roof and the trees he found that the plant, which he assumed had been destroyed, had not even been uprooted. Its canes were lying stretched out in the grass - not many leaves and even fewer petals left, but it was put back on the trellis and lived for decades. I hate driving in ice and snow, shoveling snow, scraping ice, being cold. I've been through more than enough hurricanes. I'd rather read about extreme weather than experience it. I think Rhys has the best idea - two homes. In 2008 we had 200" of snow over the course of the winter. That's a lot, even for the Crown of Maine, in fact, it was a record, but Mainers are a hearty sort and we all did well. Of course, that was followed by the winter of 2009 and -50 degree temperatures. Yep, that's a minus sign. We were lucky though, no major ice storms. Those are the stuff of nightmares. In 1992 I lived through Hurricane Andrew, in South Florida. I camped at a friend's in a secure house, we had a battery operated TV. I remember Bryan Norcross saying, "People in South Florida are dying tonight." We were hard hit, but not as hard hit as they were in the Homestead area. I was assigned down there after the storm. The first time I went down I kept thinking things couldn't get any worse, but they did. In 2005 I was in Hurricanes Katrina and Wilma in quick succession. Katrina was not anywhere near what it would be by the time it got to Louisiana, but the eye passed right over our house. My husband and I used the calm time to shore up our fence (it sort of looked like yours Hank). Wilma was the scariest, we had a tornado in our area. I could hear the mango tree out front twisting away and limbs beating on our roof. Our house was under contract for sale at the time, and we were days from moving to Maine. I wondered if we would have anything left to sell. We did, but the clean-up was hellacious. That was the year they used Greek letters for the balance of the hurricane season. Still, out of all of that, the word "earthquake" makes me break out in hives. I can't imagine living in an earthquake area. No warning. I have chills. I was about halfway through a three and a half month walk through southern England.Sometimes I camped and sometimes I did B&B. I'd stayed in a B&B in Boscastle, Cornwall and had left the next morning. I camped that night. The next day I fetched up at another B&B farther south and the hostess asked where I'd come from. I said I'd been in Boscastle two nights before. She said, "It's gone now." A bizarre series of torrential storms (a rare meteorlogical conversion) had drenched the hills above Boscastle, even as the village was kissed by sun, and sent millions of tons of water down through the narrow Valency River valley, destroying everything in its path, including much of the coastal village. I'd missed it by perhaps five hours. I remember walking along the Southwest Coast Path as the squalls blew in from the Atlantic that afternoon. The rain was horizontal. I crouched over in the lee of the stone walls lining the path with each short incoming squall and the rain blew right past me. Never got wet. But Boscastle was nearly destroyed. That storm features in my novel, "Water, Stone, Heart." Will, you know how much I love Water, Stone, Heart, and the description of the Bocastle flood in the book will stick with me for a long time. Talk about using weather to good advantage in a book! !